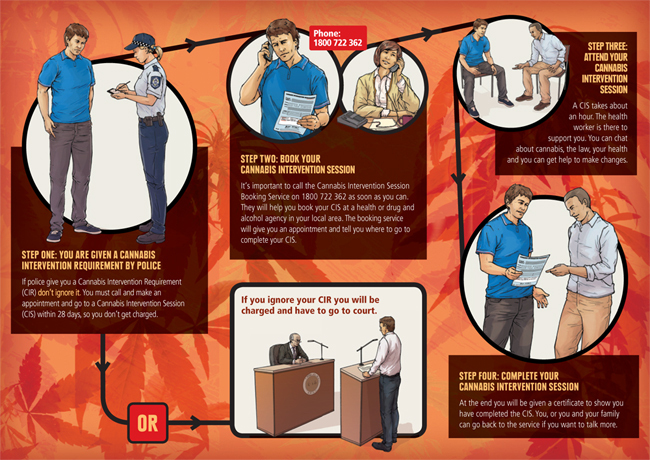 By law, police can issue a Cannabis Intervention Requirement (CIR) to people caught possessing or using small amounts of cannabis and/or possessing smoking implements found to contain traces of cannabis. A cannabis intervention session is facilitated by a trained drug and alcohol counsellor recognised by the Drug and Alcohol office. GRSI is one of three agencies in the Goldfields permitted to conduct these sessions. If issued with a CIR, you must contact the booking service to arrange an appointment. Sessions must be completed within 28 days of the CIR being issued. If you book and complete a CIS you will not need to appear in court and no further action will be taken against you for the alleged office. Adults who fail to complete a CIS may be prosecuted through the courts. If aged between 14 and 17, you can be issued with two CIR notices and upon receiving a third notice, will be referred to a Juvenile Justice team in preference to being charged. If you have been issued with CIR notice, please contact 1800 722 362 immediately to schedule an appointment.